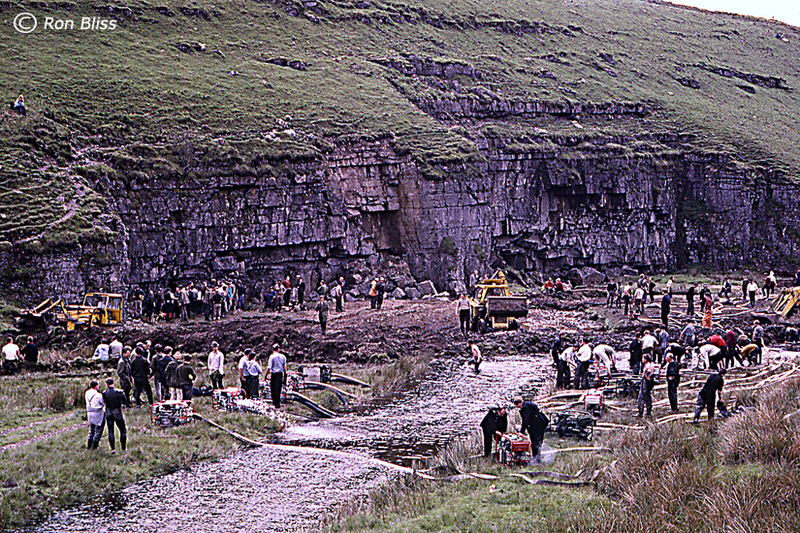 Anyone who was involved with the Mossdale Caverns rescue attempts on 24th to 28th June1967 will know that weekend marked the end of a prolonged dry spell in the dales. It had been good weather all over the country, In fact, a dry June. The breakdown in the weather came late Saturday evening, 24th June, with thunderstorms and torrential rain over the dales, including the Mossdale catchment area, which is huge. The WRPC had booked a club meet to do a Simpson's – Swinsto exchange in Kingsdale but the weather conditions didn't look good for that, on Sunday morning 25th June. I didn't know anything about the Mossdale incident until about 0840hrs, when a police car came up our street in Bramley, Leeds, as we were loading the tackle onto the bus. (I was the tackle manager then – so the bus called at my abode for all club meets.) The police officer told us about the Mossdale call – out and as members of the Leeds area CRO team, we responded immediately. We left Leeds at about 0900hrs. I went by private transport to Yarnbury, Grassington, where a few people commenced the walk to Mossdale Scar. We didn't go via the How Gill Nick route, but used the public footpaths, just to the west of Gill House, which joins up with the Bycliffe track from Conistone. Rescue vehicles, Landrovers, tractors etc. were driving up from Conistone and the track was rapidly becoming impassable. A short time later, I arrived at Mossdale Scar. The weather was cloudy with occasional showers. Persistent rain had ceased earlier. Just before the track rounded the last bend, but still not in full view of the scar, the first thing I saw was a huge column of water forming a large arc, which eventually fell back to the ground, some distance away. Further on when the whole scene came into view, I could see the water was coming from large fire-brigade high capacity pumps, run from generators, with cables and large hose pipes laying strewn across the ground. The pumps were extracting large volumes of water from Mossdale beck and putting it into a diversion trench over a hundred yards long, taking the flow safely past the scar and on to Bycliffe sinks. A dam had been constructed across Mossdale beck, but the water level behind the dam wall was still very high. The trench was being widened and the dam wall built higher, which in turn required extra re-enforcements to be made almost continually. The initial call-out had come to UWFRA at just after 11pm Saturday evening. 24th June. The response was huge and there was no shortage of manpower at the scene. There were cavers from many different clubs, various rescue teams , police, fire-brigade, medical teams, tractor and digging-machine drivers plus a contingent of general helpers, all in attendance at Mossdale Scar. Mechanical diggers had been used for the heavy construction works, but the first diversion trench and dam across the beck later proved to be inadequate for the prevailing and developing weather conditions to come. Underground teams had worked all night in the cave but there had been no appreciable fall in water levels until late morning, Sunday 25th June. UWFRA and CRO had combined resources at the scene and the pool of manpower available was still increasing, as time passed .At about 1130 hrs. Sunday, surface rescue controllers addressed a large crowd of cavers and helpers asking for anyone who had previous experience in Mossdale and at that point Richard Dickinson (Jake) WRPC (later HWCPC) Leeds area CRO team and I, volunteered to lead the first search team into the Marathon passages. We were to conduct a speedy reconnaissance and search for five missing men .The real experts for Mossdale (ULSA) were, of course, absent and otherwise 'engaged' at their new find at Black Shiver Pot, on Ingleborough. Telephone contact with Rough Chamber was established just after noon, Sunday 25th June. Our team of initially, six men, prepared to go underground to search beyond Rough Chamber and into the far reaches of the cave. In the Marathon passages and beyond, contact with the surface was not possible, until our return. The first search team led by F. Rayner entered the system in the early afternoon to explore “Far Marathon Passage.” This team consisted of Frank Rayner WRPC (later NCC) Leeds area team CRO, Jack Bloor GC Leeds area team CRO, Richard Dickinson (Jake) WRPC (later HWCPC) Leeds area team CRO, and three university members. ( Names unknown.) When we arrived at Rough Chamber the all clear was given from the surface, to proceed with the search into Far Marathon. Jim Eyre was already at Rough Chamber when we got there and he remained at the telephone to maintain contact with the surface. I am absolutely certain that he did not come with our six-man team. I saw him there when I left to begin the search and he was still at Rough Chamber when I returned later in the afternoon. The team moved quickly along Rough Passage and into Near Marathon, but as we got further along the crawls the 'mood' within the group became very subdued and worried. Nobody spoke at all. The passage had obviously been recently flooded to the roof everywhere. Richard Dickinson and I took it in turns to lead the way. Periodically, we had to slow the pace and even stop to move flood froth or foam aside, in order to progress. We all became very concerned about what we might find. Anxiety grew and I tried not to think about where we were, or what could happen to us in flood conditions. The acoustic properties of the passages didn't help either. They produced a cacophony of very eerie 'booming' and 'gurgling' sounds, which echoed around us. It was obvious to everyone it was a very dangerous place to be during inclement weather. We were in Far Marathon- then suddenly; a miner's electric cap lamp, in the middle of the passage. A short distance further--two bodies. Everyone was devastated. The scene hit us hard. It was our worst nightmare come true. One of the three university members with us immediately left the team to return to Rough Chamber; perhaps he was suffering from the tension of the situation or from claustrophobia. Who knows? At any rate, our team was instantly reduced to five men, to carry on with the search. I noticed my acuity of vision increased greatly and my colour perception was intense. I found out later this could have been due to shock. We moved forward again. There was enough room to pass by the first two of the drowned men, but airspace in that general area during a flood would be non-existent. Some distance further along Far Marathon was three more deceased men. There was no need to go any further, Jack Bloor spoke first and said: “We must identify as many people as possible before we leave.” This grim task fell to Jack Bloor and Richard Dickinson. It involved moving the bodies and looking at the albescent faces of the dead. I think it's inappropriate to mention any names here, suffice to say Richard knew three of the group; two others were unknown to us. The remaining two university members with our search team had waited back along the passage. We had completed the task allocated to us and it was time to leave. We returned to Rough Chamber in the late afternoon Sunday. 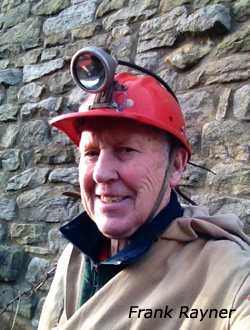 Jim Eyre picked up the telephone and reported the sad news to those outside the cave. Controllers and other surface personnel had been monitoring the condition of the dam across Mossdale beck and also the deteriorating weather conditions, throughout the afternoon. They were concerned about the safety of the underground teams. The potential for another catastrophe was very real and consequently a few minutes after the bad news had been passed to the surface---all the teams were instructed to leave the equipment and evacuate the cave, as quickly as possible. This was completed by about 6pm Sunday. The weather then obliged with another thunderstorm and torrential rain. Later, it became known that there were actually six men in the original party. This was confirmed by John Shepherd, who was in the original group. Nothing more could be done about the missing man on Sunday, until at least the weather had settled again. Water was right up to the top of the dam -wall and nearly spilling over when we left. I have two points to mention here. Firstly, no one had been in the Marathon passages, before our six-man team. I didn't see any other men or search teams going into or coming out of the Marathon passages along the original route, or the Far Marathon (East), during that day. The fact is, there simply wasn't enough time for another team to be looking and searching for the missing men, in that area or beyond. The whole idea behind the small team was for fast progress, in a dangerous area and it was fast, both in and out of the Marathons. We didn't have any route finding delays either. Secondly, there wouldn't have been any point in risking more men than was absolutely necessary for the task, in view of the unstable weather and the condition of the dam across Mossdale beck. After prolonged overnight rain, it was found that the dam across Mossdale beck had been breached in two places. It was obvious that a great deal of extra work was required to make the dam safe again. Any operations into the far reaches of the cave were suspended until this was achieved. Eventually, the main dam was declared safe again and also a secondary emergency dam constructed. This work took all Monday to complete. Late on Monday and into Tuesday, the Settle-Ingleton team ascended the acclivity behind Mossdale Scar, to assess the possibility of a dig at Black Edge Pot or Black edge shakehole. It was hoped to access the cave via a high aven shown on the survey, near to Rough Chamber. This would have been a truly colossal task. The idea was found to be impractical and later abandoned. At one point a massive drilling machine was offered, capable of sinking a shaft into the cave. The equipment weighed in at over 50 tons. Transporting it across soft moorland ground would have been almost impossible; so this offer was not taken up. (There was also a high hourly charge- rate for the machine.) The modern grouse- shooters' road which goes up in that general direction, behind the scar didn't exist in 1967. Richard Dickinson and I returned to the scene again on Tuesday morning. This time, we got a lift up from Conistone in a Landrover belonging to one of the digging- machine drivers. We remained there all day. 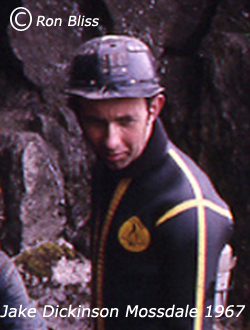 Mid-afternoon Tuesday, D. Brook (ULSA) led a party underground into the Marathon passages and beyond, to make an extensive search of the far reaches of the cave. They did not find the missing man. This team confirmed the names of four of the deceased. The lamp our team had found on Sunday in the middle of the passage, in Far Marathon was found to be about 100ft nearer to the cave entrance, from the first two bodies. On closer examination, it was also found to be stamped with the initials “CRV.” During Tuesday Dr Hugh Kidd and Ken Pearce of Derbyshire CRO team entered the system and examined the deceased, confirming the cause of the deaths of the five men was asphyxia, due to drowning. In view of the fact that there was still one man missing from the original party, it was decided to make one further last search in the cave. Richard and I were asked to lead B. Boardman CRO and his team to the start of the Marathon passages. We entered the cave again late Tuesday evening. Boardman's task was to examine all side passages and two loops in the Marathons. Richard and I were to search the 'Kneewrecker System.' This we did for a considerable distance, but we found nothing. We exited the cave for the last time at approximately 0300hrs Wednesday 28th June. Later, I learned that the Marathon team had finally located the last missing man. From this point, the Mossdale operation was run down and the landscape returned to as it was before. I can recall the rescue attempts at Mossdale with vivid clarity. I'll never forget it. I've never really spoken much about the rescue operations, much less written anything about them. The memories of what happened there still upset me. I will not be pressured into acquiescence, regarding other fictitious or an imagined sequence of the events of that weekend in 1967. I have given an accurate and truthful first-hand, eye-witness account of what actually happened to me personally, whilst at the scene. Twenty five years after the Mossdale incident (1992). Mick Watson was walking in the area when he noticed that the memorial plaque attached to Mossdale Scar had come loose. It was originally only nailed to wooden chocks, in cracks on the face of the scar. We both decided to make an effort to fix the plaque securely to the rock-face. We drove up to Mossdale Scar from Conistone, with all the necessary equipment in a Landrover, with a section of rigid ladder on the roof. Mick obtained permission for this and the gates were unlocked. We drilled holes in the rock face, by hand, using my bolting- kit. The plaque was re-secured using M8 Allen cap-screws, at about 12ft from ground level. The job was completed in about 2hrs.